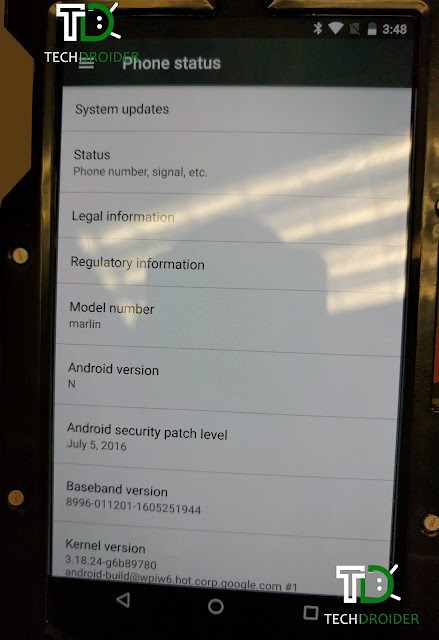 [Updated] Exclusive: Nexus Marlin First Real Image! Yesterday, we brought an exclusive Galaxy Note 7 picture, and today we bring to you... Guess What? The first Real picture of the new Nexus device coming later this year. As you can see from the picture, this prototype is covered by a case to avoid any kinds of design leaks but we do see its screen mentions it's running Android N with the latest security patch from July. We still have no info on release date or any other confirmed specs, but we will keep pictures coming as soon as we get them and accordingly,this is going to be Best Nexus Smartphone till now, so stay tuned to our website. Update :- The Above Nexus Marlin Prototype has 128 GB Internal storage. It's a full metal device with no Camera bump at the back . The Device almost looks like HTC 10 with Fingerprint sensor at the back. Update 2 :- Nexus Marlin Probably uses same camera sensor from Nexus 6p.